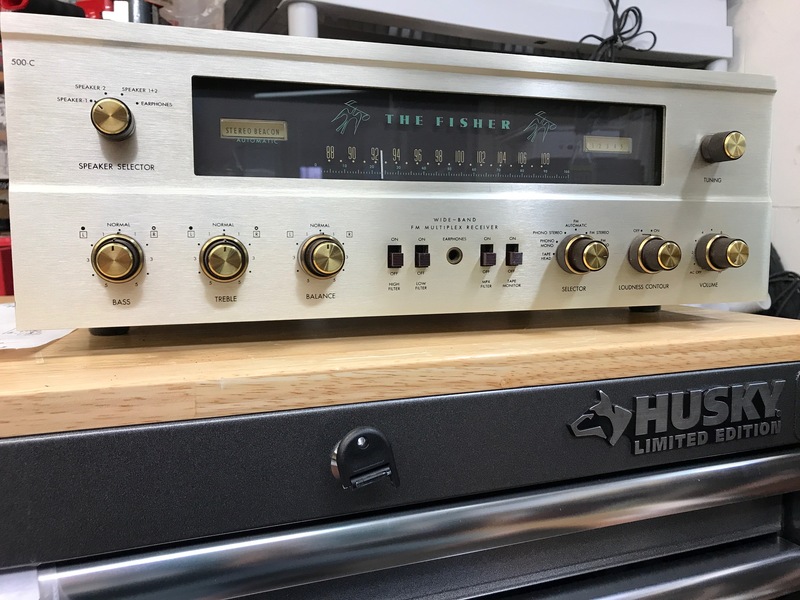 This isn’t as in depth as our other recent write-ups, however we do these often and wanted to give a full run-down of the restoration and modification procedures we do for Fisher 500 receivers. 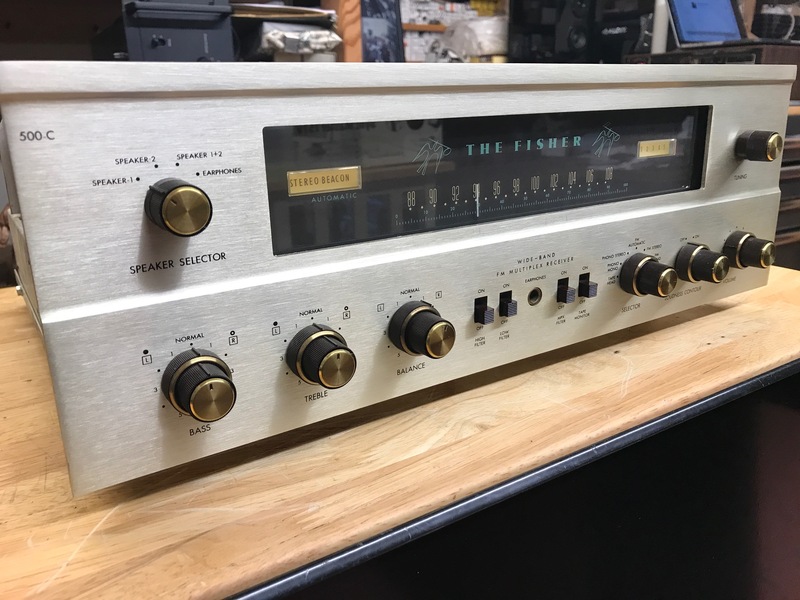 With the Marantz 2270 being our most common restoration, Fisher 500 receivers are the clear runner-up! The one in this write-up is currently for sale in our store! 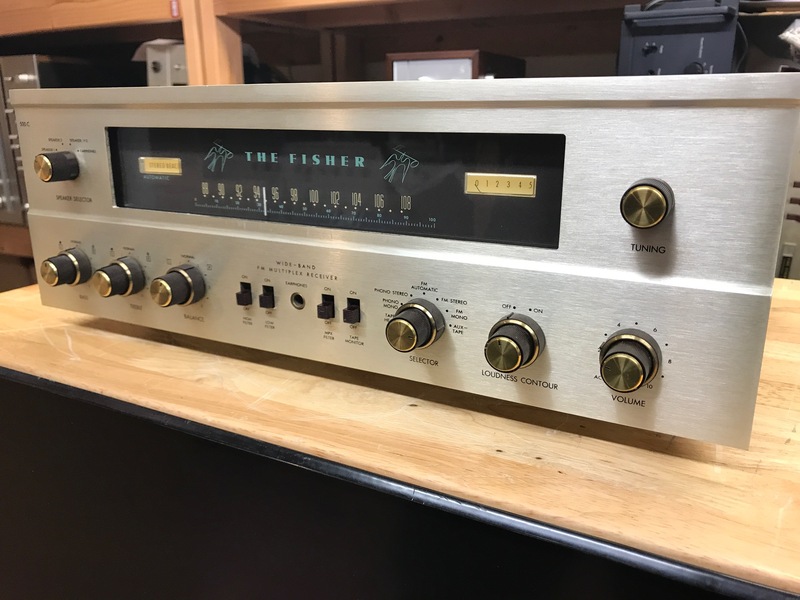 This unit has been completely restored, and it works and sounds better than new! 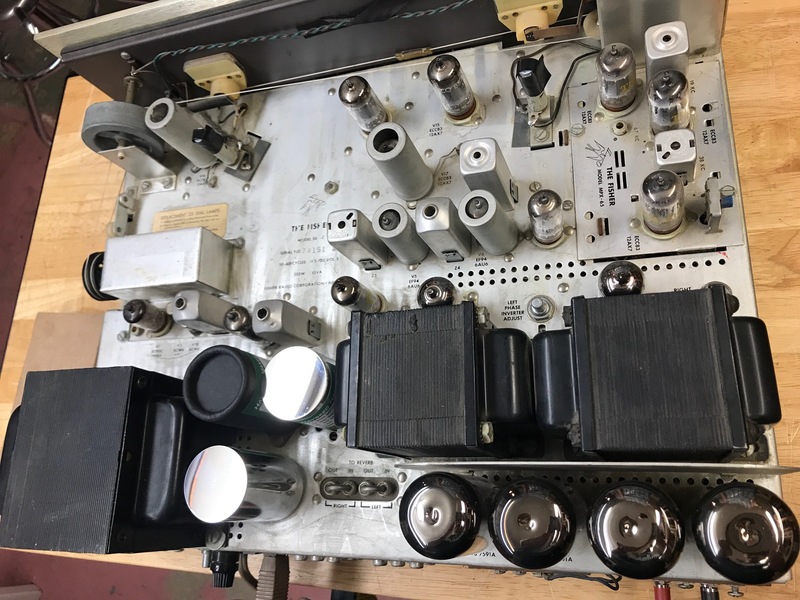 The power supply was completely redone, as well as the signal path (except FM). Controls were cleaned, LEDs installed, and a few modifications were also added to let this unit run a little smoother and A LOT safer. The unit had all of its tubes tested, and some new tubes were installed. A full description of the unit and the work done is below. 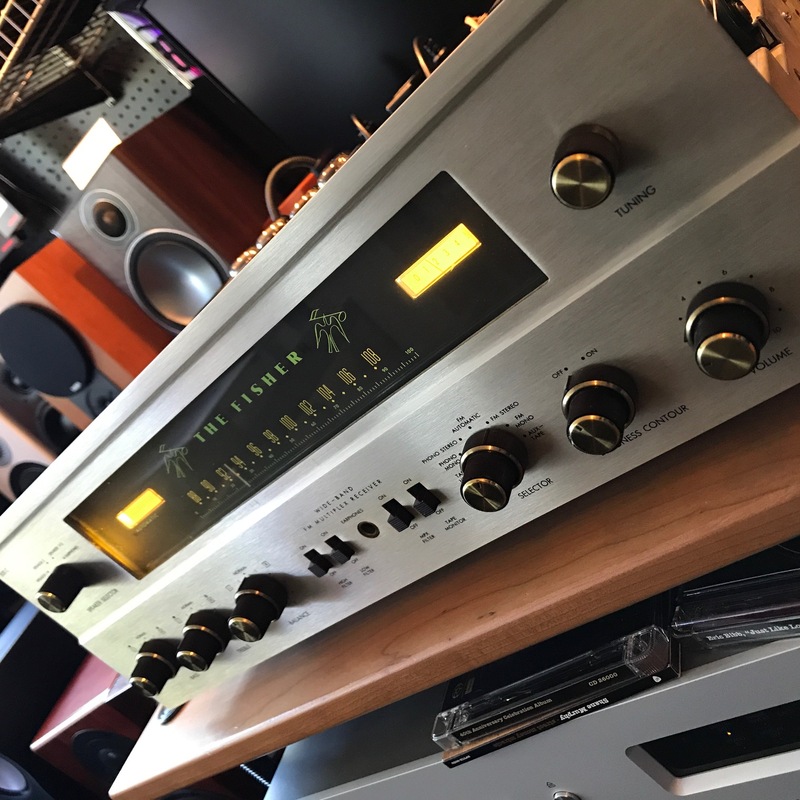 The original power tubes were shot, we replaced with a new MATCHED QUAD of ElectroHarmonix 7951A tubes. 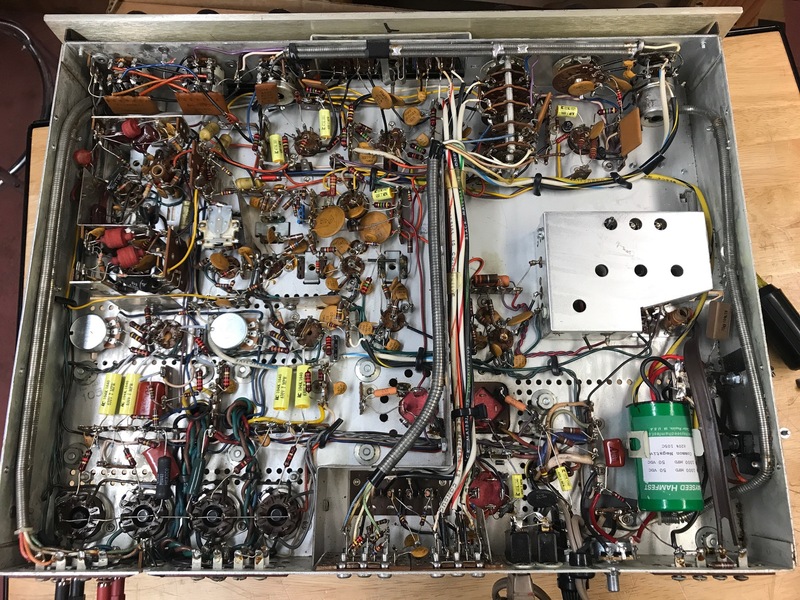 One of the phase inverter potentiometers was shorted, so both were replaced and new ElectroHarmonix 12ax7 tubes were installed in the phase inverter section. 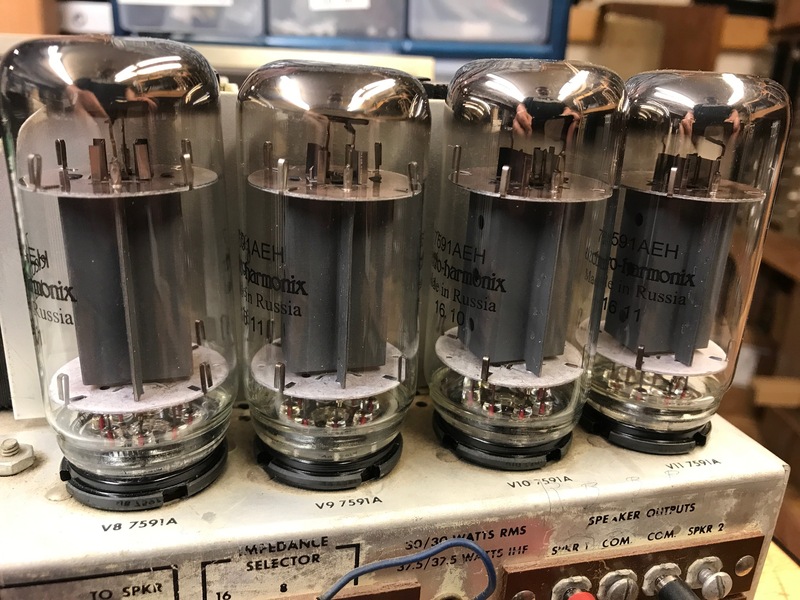 The original Telefunken 12ax7 tubes in the phono and preamp section were tested on our AMPLITREX AT-1000 tube tester. All triodes of all 4 tubes measured above spec (>100%), and close in tolerances. They were left in place. They sound great! Hayseed Hamfest can cap kit was used to recap the power supply. These are custom made for Fisher 500 units and are exact drop in replacements. All of the dropping resistors in the power supply were changed with new heavy duty replacements. 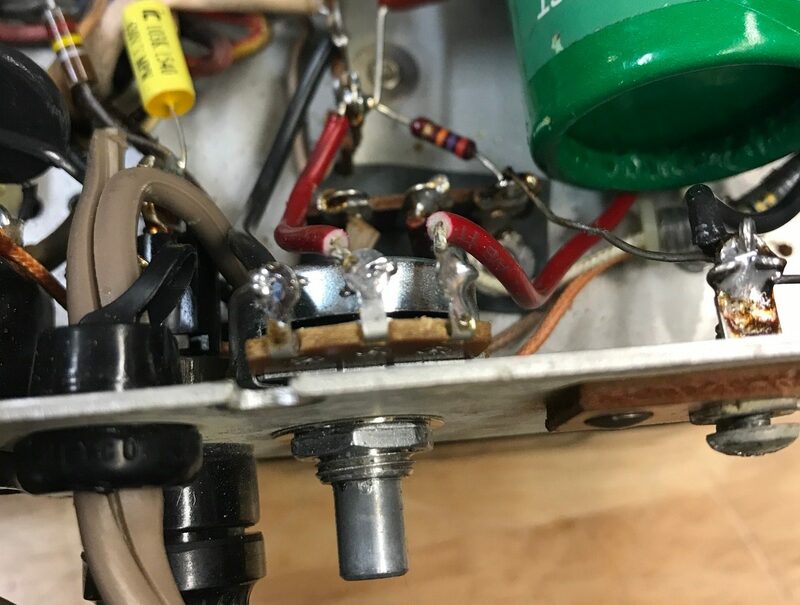 An adjustable bias potentiometer was installed in order to dial in the ideal bias for the amp. 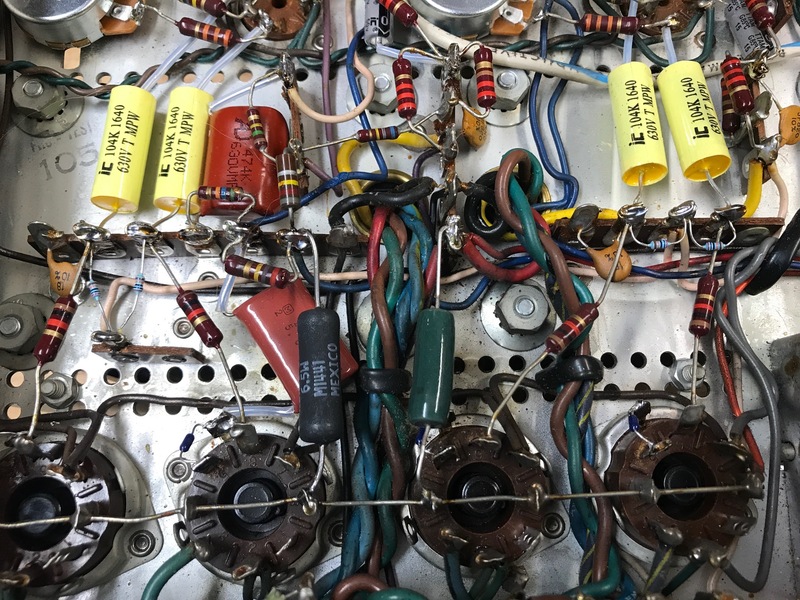 10 ohm cathode resistors were installed to measure bias and also protect the output transformers in case of a tube short. 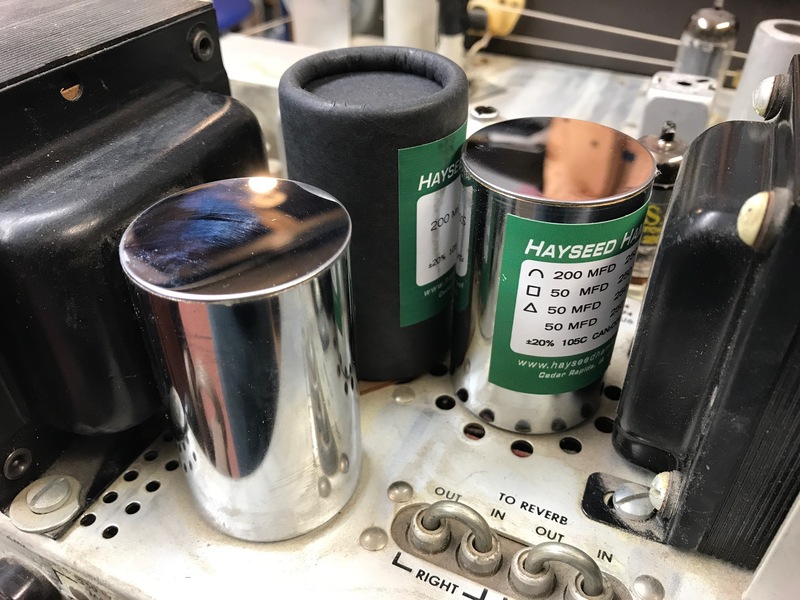 The coupling capacitors in the amplifier section were increased from .047 µF to .1 µF, and the grid resistors decreased from 330k Ω to 200k Ω to handle new production power tubes. The film caps in the phono stage were replaced with Illinois Capacitor film caps. The film caps in the preamp were all changed to IC caps as well. The few smaller electrolytics were changed with high-temp/high-reliability replacements. 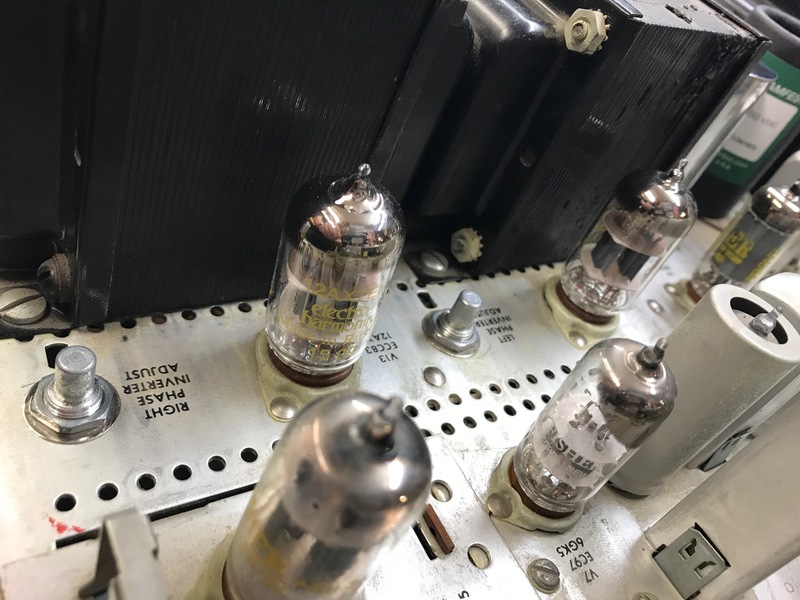 The solid state selenium rectifier was swapped out for a silicon replacement, which is safer and longer lasting. 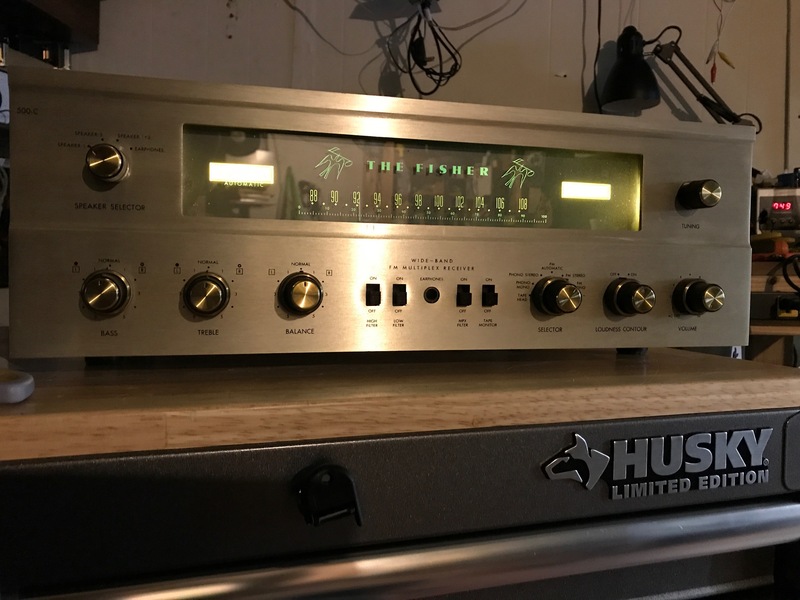 The tuner was tested and pulls in stereo FM, even in out basement shop. Tuner was untouched, as it works, to avoid more labor/cost. The lights were swapped out with LED lights which last longer and run cooler, plus they look better. The controls were all cleaned with Caig Deoxit and relubed with Fader Lube. New brass caps were added to the control knobs, custom made for us over in NJ. A new fuse was installed. A thermistor was added on the AC input for a soft-start power on. The bias was set, and the receiver was play-tested for many hours after completed. It runs perfectly.